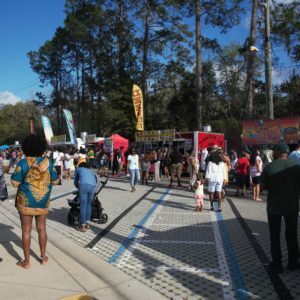 Tallahassee celebrated its Caribbean culture last weekend. There was no shortage of traditional island food, music, games and dancers at the Pavilion at Centre of Tallahassee. People with origins from all over the world attended and the public seemed overjoyed with the festival. “I am Haitian and I honestly didn’t know that Tallahassee did Caribbean events, so this was a shocker to me when I heard about this,” said Marlhy Jeudy, a third-year student at FAMU. Some Tallahassee residents are from out of state or out of the country, and often residents depend on events like these to remind them of home. “I have the feeling of being in the islands, or back home in Miami because Miami is very cultured, and Tallahassee isn’t, so being here makes you feel comfortable being away from home, just the music and the people, nothing too spectacular, just a good vibe,” Robinson said. “I wasn’t expecting this, the fact that we are close to people that are from places, where we call home such as Trinidad and Tobago , Bahamas , and Haiti” said Marlhy Jeudy. Not only was the Caribbean festival for all people including those of Caribbean origins, but also for Tallahassee’s musicians, singers, business owners and dancers. “I am from Jamaica and I have been in Florida for two months. Yes, I think that festivals like these are important, because being an entertainer in Tallahassee, there is few opportunities for us,” said Errol Reid, a reggae singer and performer. The festival promoted unity and cultural awareness throughout the festival, as well providing a diverse learning experience for the public. “There should be no fear, be who you are no matter what, don’t let anyone judge you or nothing, because god made us all different,” Millie said.